Gretel focuses on phone development, production and marketing, making their new Gretel A9 device available to public market just this month. Great news is that the A9 already got good presales and Gretel will Giveaway A9 on their official Facebook fan page to celebrate it. 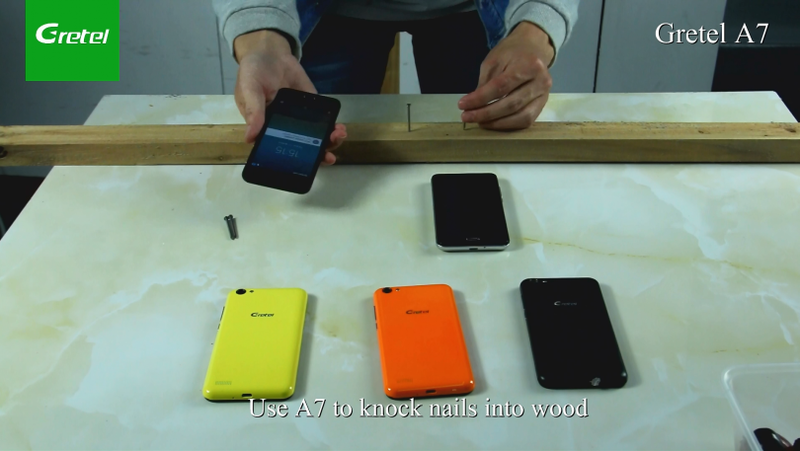 This video begins with walnut cracking testing the scratch-resistance capacity of the A7 screen, then continuously tortured by the other 5 extreme challenges: knife scratch; use A7 as the cutting board; hammer smashing; use A7 to knock nails into wood and drill test. It’s delivered a stronger, more durable glass designed to withstand the abuse we often put our gadgets through, such as dropping it in a pocket with your keys. Also from this video, we can get the appearance design concept of Gretel A7. It will come with a small size screen -Probably 5 inches- and home button design, for those who prefer to use their device with one hand, Gretel A7 will be a perfect option. That aside, it is said that the A7 will be the first 3G smartphone to power on Samsung camera sensor and Gorilla Glass JDI display technology. For now, less is known regarding all the other details and features of the device, Just stay tuned here for more updates.